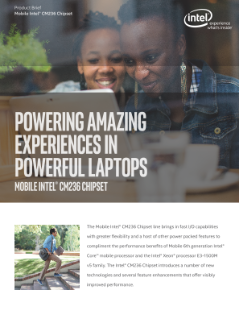 Review this product brief and discover the features and benefits of the mobile Intel® CM236 chipset line, which introduces a number of new technologies and sensor-enhanced capabilities, like additional ports and faster data transfer between processor and the Platform Controller Hub (PCH). Get Intel level performance from anywhere in your home with a less-cluttered All-in-One (AIO) PC. PCs with Intel Inside® with up to 27-inch HD displays, built-in battery, 3-D graphics, and more. See what makes Thunderbolt™ 3 the most advanced USB-C available, with lightning speed in one thin, reversible compact port.